Garth Brooks opened the CMAs by telling the audience that the event would be "dedicated to the 12 individuals who we lost far too soon just a week ago tonight at the Borderline in Thousand Oaks, California." 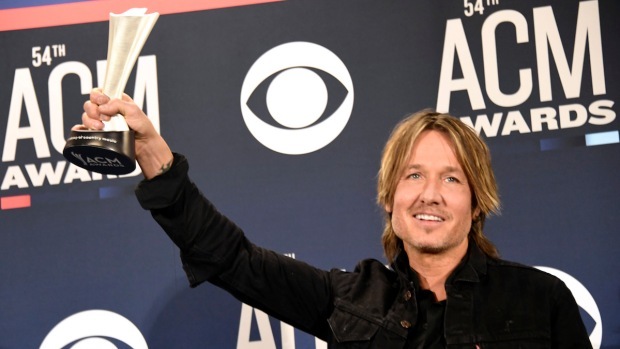 Keith Urban wipes away tears as he accepts the award for entertainer of the year at the 52nd annual CMA Awards at Bridgestone Arena on Wednesday, Nov. 14, 2018, in Nashville, Tenn.
Kacey Musgraves, the only woman nominated for album of the year, won the prize for "Golden Hour." "This is really, really crazy timing — 10 years ago today I moved to Nashville. That's so crazy," she said. Dan + Shay lost in all four categories they were nominated in but gave an impressive performance of their hit "Tequila." When Brothers Osborne won vocal duo of the year, John Osborne said, "I thought this was going to go to Dan + Shay. Make some noise for those boys."